iVisit has just released a new beta version of application software that will enable multiparty conference audio/video calls at no cost. With this newly developed application software, users will be able enjoy free audio as well as video calls in both Windows Mobile devices and desktop system. The software application is claimed to be able to work across all different platforms offering seamless connectivity among various mobile to desktop connectivity and vice versa. Some of the great features include Push-to-Talk, Text Messaging, Photo Messaging as well as Multiparty Video Conferencing. Depending on the package selection, users will be able to enjoy GPS location based services that will help to locate and track own location if they subscribe to Desktop and Mobile Premium package. The beta version of software release can be obtained from iVisit at no charge. Some of the supported mobile devices’ models are listed here. 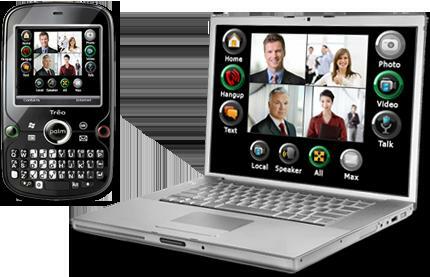 Not to be surprise, it is compatible with those latest models such as HTC Touch Diamond, Palm Treo 800w, Samsung SCH-i760, AT&T Tilt and many more. Don’t be disappointed if your mobile model is not in the list since the developer promises to enable additional Windows Mobile, Symbian based devices and even the popular Apple iPhone in short future.